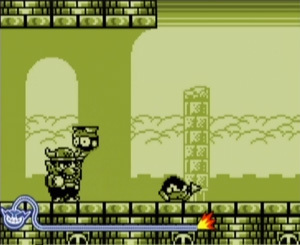 Wario discovers the Form Baton, an ancient motion-controller relic that allows him and his friends to design a new series of five-second microgame challenges. 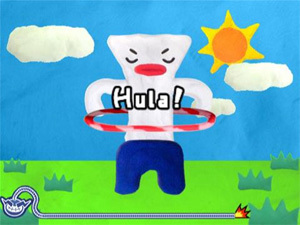 Before each microgame you are given a pose to adopt with the Wii Remote, then you must react to the on-screen prompts to clear the minigame. Microgames are grouped by different characters who created them, including newcomers Penny Crygor and Young Cricket, each introducing several new poses. At the end of each group you have to clear a longer boss stage. You can revisit any of the microgames you have already played or take part in multiplayer challenges for up to 10 players. 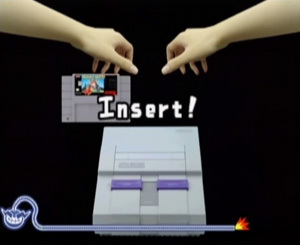 On the Wii Menu, when you select the Disk Channel with WarioWare: Smooth Moves inserted, Wario shouts out "It's-a Wii! Wario! ", an inversion of "It's-a me! Mario!" 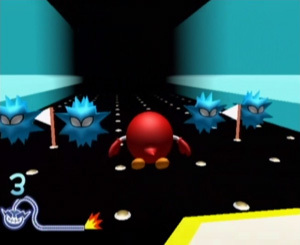 from the Super Mario 64 title screen. The Form Baton, the mystical item that Wario discovers, is shaped like a Wii Remote. After clearing the main story mode, you also unlock the Balance Stone, shaped like the Nunchuk attachment. 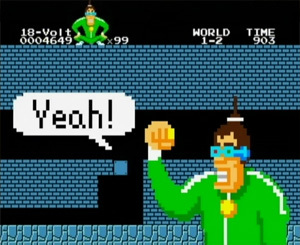 The story before 9-Volt & 18-Volt's set of microgames is filled with Nintendo references. 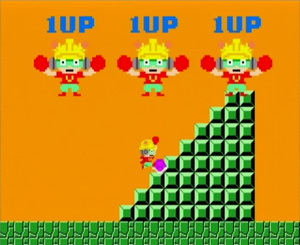 During the pre-story introduction, 18-Volt appears in level 4-2 of Super Mario Bros. (even though it says 1-2 at the top), standing above the ceiling and squatting on the coin tally icon. As unlikely as it sounds, this is based on a popular internet meme in Japan. 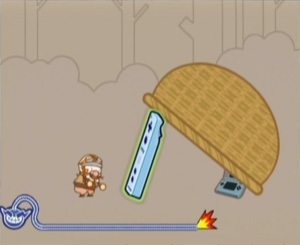 Also during the pre-story introduction, 9-Volt appears kicking a shell against a staircase, performing the infinite 1UP trick from Super Mario Bros. 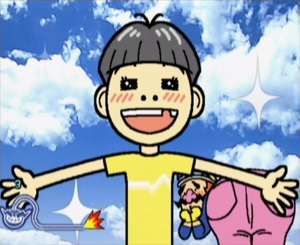 This is followed by each of the characters shouting "Game" and "Boys" – a reference to the Game Boy. 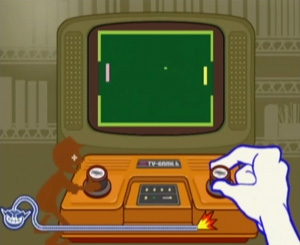 9-Volt buys a Game & Watch (Donkey Kong), which 18-Volt suggests is a Nintendo DS. The pair squabble over it and break it, so 18-Volt goes in search of a new one. 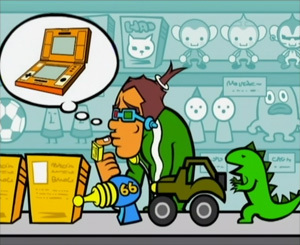 In 9-Volt & 18-Volt's story, 18-Volt looks for a new Game & Watch in a toy shop. On the shelves behind him are three monkey dolls. 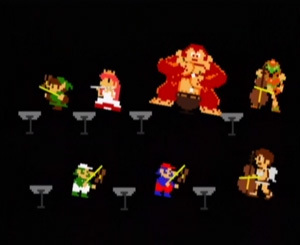 These monkeys actually appeared first in Rhythm Heaven on Game Boy Advance, developed by the same team as WarioWare. The monkeys also appear during the prologue of Young Cricket's story. In 9-Volt & 18-Volt's story, 18-Volt ends up in a game store. On the shelf behind the shopkeeper are the classic Nintendo toys, Love Tester (1969) and Chiritorie (1979). There is also a poster of Diskun, the mascot for the Famicom Disk System add-on for the Famicom (NES) in Japan. During the game, the shopkeeper pulls out a ? Block (from Super Mario Bros.) to signal the start of another microgame. When you clear the story, you can see that the store owner resembles Satoru Iwata, president of Nintendo Co. Ltd. During the character credits, he is listed as "Shopkeeper Iwata". 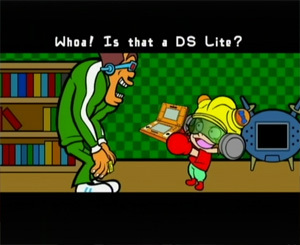 As with the other WarioWare games, 9-Volt's microgames are all based on other Nintendo games. 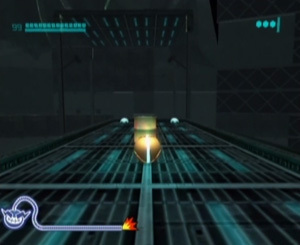 A Wii Remote and movement directions are shown on screen. Simply follow the directions to make Wii consoles appear. Based on Super Mario Bros. (1985 Famicom/NES). Hold the Wii Remote in the Umbrella pose and move it sharply upwards to make Mario jump. Collect two Coins. 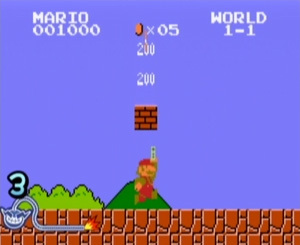 On later difficulties, Mario is running and there are obstacles in the way. Based on Color TV-Game 6 (1977), an early Nintendo system that plays Light Tennis. Hold the Wii Remote sideways and turn it like a dial to move the paddle up and down to stop the ball. Based on Animal Crossing: Wild World (2005 Nintendo DS). When the fish splashes on the lure, pull the remote up sharply to catch it. Luigi didn't appear in Donkey Kong, but his sprite is the same as Mario's, recolored as in Super Mario Bros.
Based on WarioWare: Twisted! (2004 Game Boy Advance). 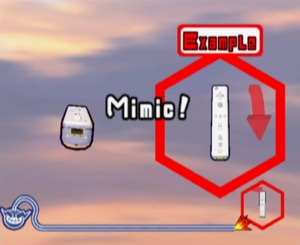 Hold the Wii Remote like the on-screen Game Boy Advance and rotate it to clear the three microgames (one for each difficulty level). Based on Wario Land (1994 Game Boy). Raise the Wii Remote to lift the enemy and swing to throw it. On the first two levels you have to throw it to bust a block or enemy, but on level 3 just lift it to guard against a falling enemy. 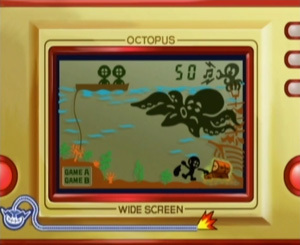 Based on Octopus (1981 Game & Watch). Set the Wii Remote down, and wait until the diver has collected some treasure before picking it up to retreat back to the boat. A 3D game based on the classic NES title Balloon Fight. Flap your arms to stay in the air and avoid the sparks, fish and enemies. Based on Metroid Prime 2: Echoes (2004 GameCube). 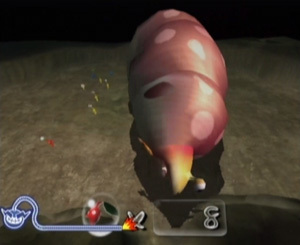 Roll Samus in Morph Ball mode to knock over the oil drum. Based on Pikmin 2 (2004 GameCube). You control Empress Bulblax. Turn the Wii Remote to roll her over all of the Pikmin. Based on Nintendogs (2005 Nintendo DS). Move the hand under the dogs' paws so they give you a low-five. Based on Super Mario Sunshine (2002 GameCube). 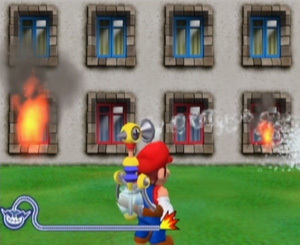 Point Mario and FLUDD at the burning windows to extinguish the fires. Based on Mike Tyson's Punch-Out!! (1987 Famicom/NES). 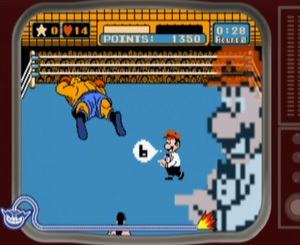 As Mario the referee, point the Wii Remote forward and back to finish counting to 10 so Little Mac wins the fight. In Japan, the system is the Famicom and features different games. If you know which games appear in the Japanese version, please contact NinDB. Actually based on the Light Gun: Duck Hunt toy from 1976, and not related to the earlier Laser Clay Shooting arcades. 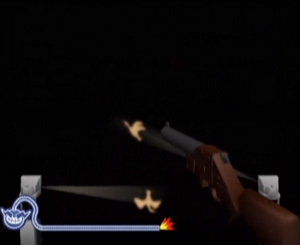 Point the Wii Remote at the ducks and press A or B to shoot them. Based on The Legend of Zelda: The Wind Waker (2002 GameCube). 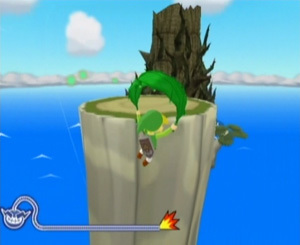 Link is drifting with the Deku Leaf, so point him to a safe landing spot. Based on Brain Age (2005 Nintendo DS). Based on Connect Maze, draw a line between the numbers in order. Based on The Legend of Zelda: Ocarina of Time (1998 Nintendo 64). 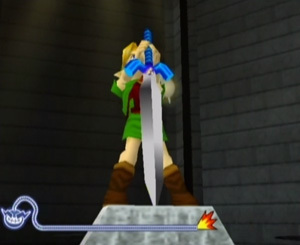 Pull the Master Sword from its stand by yanking on it. On Level 1, Link transforms into adult Link, on Level 2 he turns into an old man and on Level 3 he turns into a Cucco (chicken). Based on the Ultra Machine toy (1968). 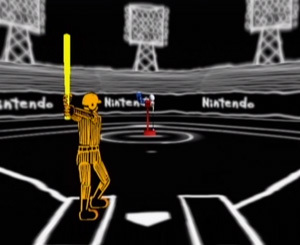 Swing the Wii Remote to get a home run. A 3D game based on the NES title Clu Clu Land. Guide Bubbles around the Urchins and Black Holes and reach the flags. Move the Wii Remote back and forth to sift the sand and reveal a Nintendo treasure. The items you find are Nintendo playing cards, an original Game Boy and the Virtual Boy. Based on Star Fox (1993 SFC/SNES). 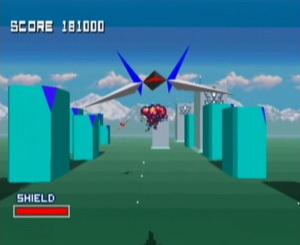 Fly the Arwing through the stage and defeat the boss. In Level 1 you have to fly over Corneria, in Level 2 you are in space and Level 3 is based on an ice planet. The boss fight is against NES peripheral R.O.B. holding a NES Zapper. Shoot the blocks (from the Stack-Up set) to defeat him. 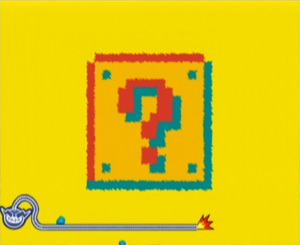 Aside from 9-Volt's microgames, a number of other microgames also feature elements from, or are based on, Nintendo games. This Mona microgame requires you to wave a fan to keep paper butterflies aloft. 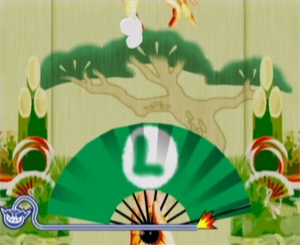 Occasionally, the design on the fan will be the green "L" motif from Luigi's hat in the Mario series. This Kat & Ana microgame requires you to trace around the edge of a shape. If you get a square it will reveal a ? Block from Super Mario Bros. This Ashley microgame is a wild west quickdraw game. If you lose, your cowboy's trousers fall down revealing boxer shorts with Super Mushrooms, Fire Flowers and Starmen from the Mario series on. This Tiny Wario microgame requires you to wave the Wii remote from side to side to clear Wario's gaseous emissions. The boy who emerges from the cloud has a zig-zag pattern on his shirt based on the pattern that appeared on Japanese Famicom carts. 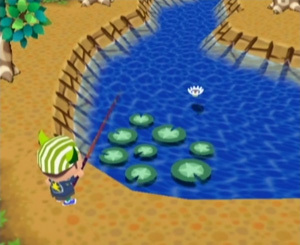 This Tiny Wario microgame requires you to grab the Wii remote just as Wario walks under the basket to take the bait. Sometimes the bait will be a Nintendo DS. This Tiny Wario microgame requires you to slap Wario to wake him up. 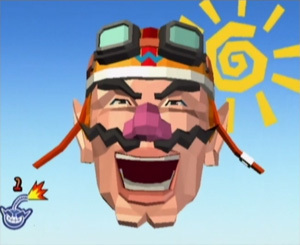 The design of Wario and his expressions are based on the 3D head of Dr. Kawashima in Brain Age. The Tiny Wario "Paper Mario" microgame is named after Paper Mario. The Wario "Crowd Control" microgame features a crowd made up of simple drawings of Wario and Waluigi. This is the first time Waluigi has appeared in a Wario game. 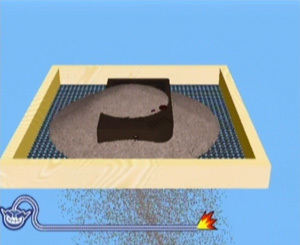 In Penny's intro movie you can see Mr. Game & Watch, the representative of the Game & Watch systems created for Super Smash Bros. Melee. 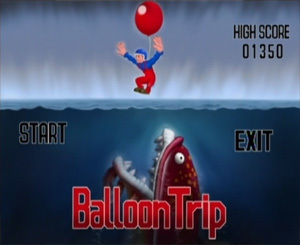 The 3D Balloon Fight has also been adapted into a full minigame. 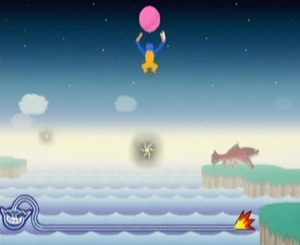 Using the Nunchuk and Wii Remote together, flap the Balloon Fighter's arms to stay aloft as he crosses the sea. You can steer by flapping just one of your arms in order to grab balloons, and to dodge enemy balloon fighters, the giant fish and sparks. At every 1000 metres you are given a rest and a bonus score. One of the poses you can collect is a man with his arms raised high above his head. 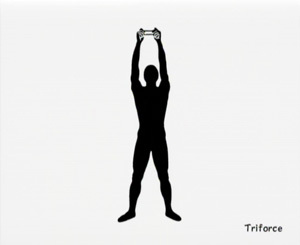 It's called the "Triforce" as it is very similar to the pose Link uses when he collects a Triforce piece in The Legend of Zelda. During the Sound Test, silhouettes of falling objects can be tapped to hear random sounds. Among the falling objects are Wii Remotes and NES Controllers. The Staff Credits option on the Diamond City map is represented by an office building. This is the Nintendo Co. Ltd. headquarters in Japan. 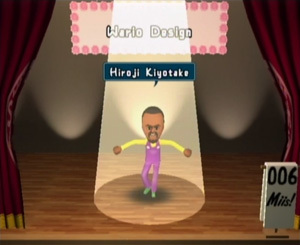 During the Staff Credits, each member of the game staff appears as a Mii avatar in a custom item of clothing. Some of these are Nintendo references, and in many cases are worn by staff related to that character.